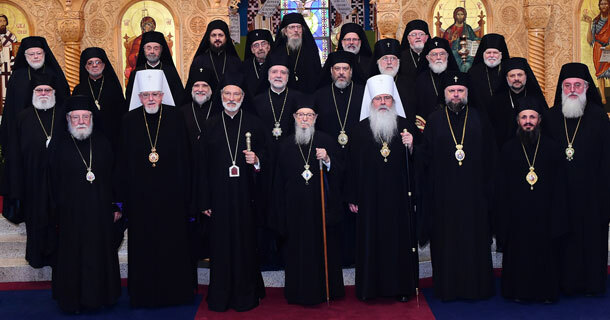 Echoing the discussion and desire of last year’s Assembly regarding the instruction of children and involvement of young adults in the Church, the Hierarchs underlined the importance of the formation of all ages of youth in parish programs and pastoral outreach, recognizing and realizing their contribution as an example for believers (1 Tim. 4:12). Therefore, we urge our faithful and especially our youth to learn and live the commandments of the Gospel and the traditions of the Church, which illumine and sustain our lives and decisions in order that we might be the salt of the earth, as taught by our Lord (cf. Matt. 5:13). To this end, we encourage our parishes to develop educational programs for baptism and chrismation of children and adults entering the Orthodox Church so that our parishioners may acquire and nurture a deeper understanding of the faith. We express our compassion and support for refugees and their families, who face immense suffering and encounter severe displacement throughout the world and even in our own country. Additionally, we denounce all violence, whether caused by senseless acts related to weapons and shootings or instigated by abhorrent acts of discrimination and prejudice. Orthodox Christians are called to demonstrate their solidarity with and hospitality to all people, irrespective of race and religion, to welcome and embrace the image of God in the least of our brothers and sisters, as instructed in the parable of our Lord (cf. Matt. 25:40-45). Our God is a God of love and forgiveness, of reconciliation and fellowship.